Founded in 1961, WWF is a global conservation charity that aims to find ways for people and nature to share the Earth’s resources fairly. The organisation operates in more than 100 countries. The WWF’s new headquarters building in Woking, Surrey, is situated on a raised concrete platform above a municipal car park. 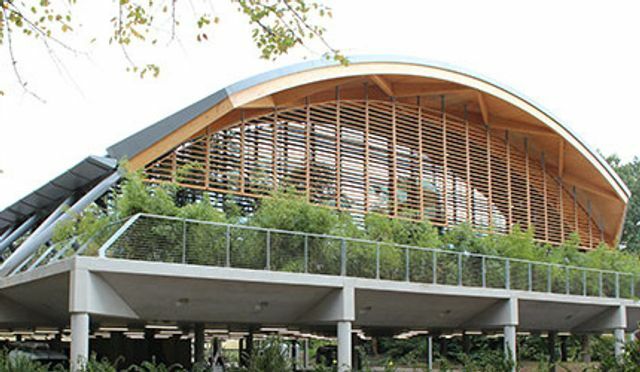 Designed by Hopkins Architects with environmental design consultants and building services engineers Atelier Ten, the pioneering two-storey building features an 80 metre-long curved timber gridshell roof with fully-glazed walls and end elevations underneath. The Living Planet Centre was named Office and Workplace Lighting Project of the Year in the 2014 Lux Awards.